For once i could actually drive the thing – for real! This was such a novelty that out of all the cars i had, this would be prized the most. These are quite rare to find these days and go for a good sum, this scarce model is a Corgi No: 236 for those who want a bit of technichal jargon. These generally go for around £100 on ebay, so if you have one- you have a little treasure. Thes Corgi cars were made in Great Britain from 1964 to 1968, though i have seen imitations on ebay in recent years, you can normally tell though at a quick glance. 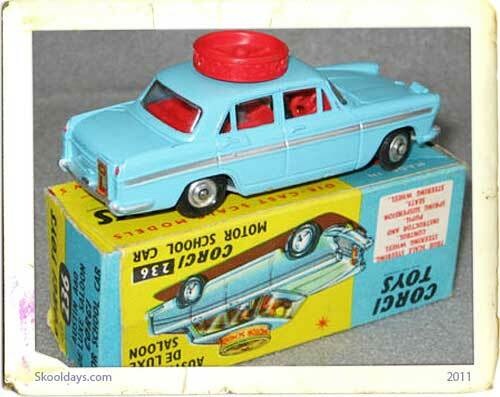 This entry was posted in Pop Culture, Toys and tagged 1960, 1970 by Skooldays. Bookmark the permalink. I bought one of these on Ebay for €10 for my brother, it was for his 50th Birthday ….. it was his absolute favorite toy as a child ……. no box and not perfect, but in great condition ….. he cried when he opened the package …… it sits on his desk in his den now. When I was young, diecast were my favourite toy, by far. Mainly, Corgi. I had the blue but, also, the light green motor school Austin. I had many Corgis; they were donated, to the local hospital, when I was a teen; not my choice.